I hate to admit it, but my vehement dislike of Gnome is not only based on technical arguments. On the contrary, I suspect that much of it is rooted in my entirely subjective and personal aesthetic perception. In other words, I always found Gnome to be plain ugly. Now, after installing OpenSolaris a couple of months ago, I was surprised by my reacion to the look-and-feel of it. Great, I thought. 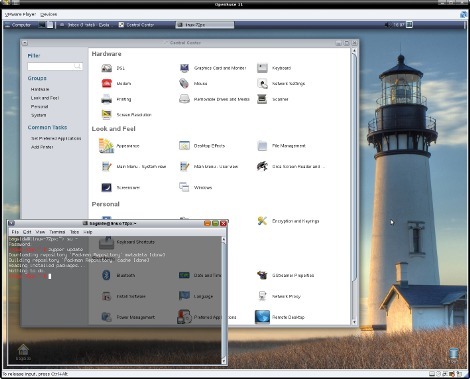 Well, as it turned out, Sun has spared neither money nor effort to create an attractive theme called "Nimbus" for its JavaDesktop. Technically, the package management of OpenSuse has been much improved over previous versions. Zypper is not yet as fast as its brothers and sisters on Debian and Mandriva, but the improvement in speed is laudable.